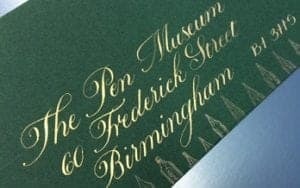 This one-day taster course will cover the basics of writing with a flexible pointed nib in the Copperplate style. The course is designed for anyone who would like to write in Copperplate, from complete beginners to those with some experience. It’s an opportunity to practice under the helpful eye of the tutor, Joy Daniels. 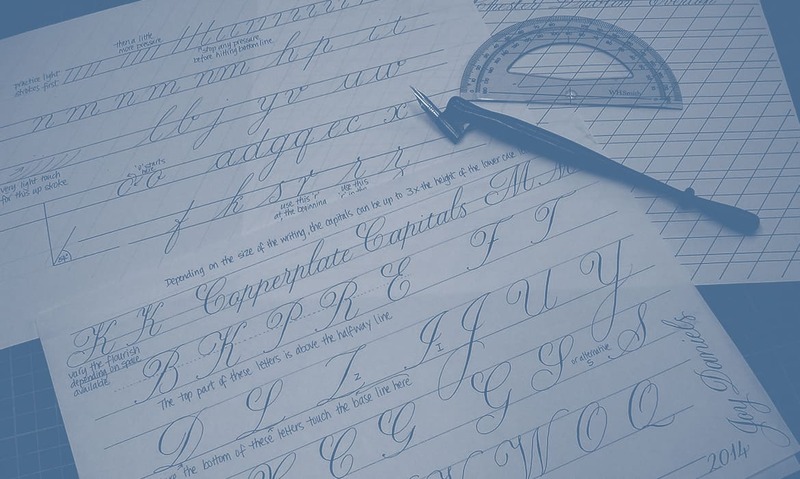 The course is an introduction to Copperplate that will take you step by step, starting with the simplest ‘shapes’ which make up the letters of the alphabet, through to the more complicated. By the end of the day you will feel more confident using the pointed nib, and then be able to practice at home with the skills you have learned. Joy can provide nibs, pen holders and thin ink for sale if you don’t already have any. Plus, there’ll be plenty of supplies available on the day from the Pen Museum shop. Just bring some practice paper like printer paper from the computer, or a Marker Pad – smooth cartridge paper is also good to use – and a ruler and a pencil. You won’t be an ‘expert’ after a one day course, but you will learn basic skills which you can build on in your own time. If you’ve already made a start with your Copperplate, Joy will help you improve and move forward with your skills. Cancellations will only be accepted 7 days prior to the event.